It’s time to set some serious goals. These 10 goals will help you make lasting changes and take control of your finances. Whether you choose to do just a few of them or you are ready to tackle all of them, you can start making changes. You are the only one that can change yourself and it is important to have a plan to make your resolutions stick. Take the time to plan for the new year today. This may seem like a simple goal, but writing a spending plan each month is the first step in getting control of your finances. If you can write out your budget each month, and put every dollar you earn in a specific place you will begin to win financially. This helps you realize just where you are each month. It allows you to decide how you want to spend your money instead of just letting it drift away. You should do this for the entire year. The first month, you may want to physically write down each purchase you make in a notebook that you carry with you. Sometimes physically writing it out makes you more aware of what you are doing. If you have a smart phone, you should find a budgeting app that allows you to enter in each transaction as you make it. You can record it in both the account and the category so you can stick to your budget and recognize your budgeting weaknesses. This is a tough goal, but as you carefully set up your budget and track it, you should be able to stick to your budget. You should be spending less than you earn and putting money into savings. If you can stick to your budget, you will be able to reach your other financial goals. Find the habits you need to change to make this happen. Make a specific goal on how much debt you want to get rid of this year. 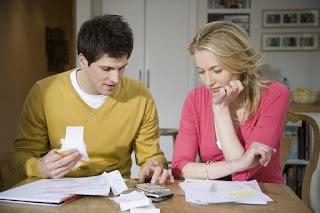 If possible, you should try to get completely out of debt, but depending on your income and the amount of debt you currently have, you may not be able to do that. You should set a goal that is attainable, but one that you will have to be careful to reach. Set a number of how much extra you want to put towards debt each month, and then work to reaching it. If you follow a debt payment plan, you will speed up how quickly you can pay off your debt. This goal is key if you are serious about getting out of debt. The one exception you may make to this goal is if you are ready to buy a new home. This means you need to stop using your credit cards. You should try to get by with your current car or save up cash for a new car. If you can commit to yourself that you will no longer borrow money, then you can plan ahead for major purchases, and really make a dent in the amount of debt you have. The size of your emergency fund really depends on your current situation. If you are still getting out of debt, you should have a smaller emergency fund until you pay off your debt. You should quickly save up between $1,000.00 and one month’s income. If your job is more volatile or the amount you make changes, one month of expenses will help you handle the slow months. If you are out of debt, work towards saving up between six months to a year of your expenses. If you are working for a company, you should contribute up to the amount that the company will match until you are out of debt. Once you are out of debt, then you should begin contributing about fifteen percent of your income. The amount you get from your employer’s match should count towards that fifteen percent. Otherwise, you should contribute about five percent until you are out of debt (not counting your mortgage). This allows you to start building your retirement savings, while still freeing up money to put towards debt. If you do not qualify for a 401(k), you should be contributing to an IRA account. This year you need to do something to advance your career. If you love your job, and you see yourself staying there for the next 10 years, you can still find something you can do to improve your career stability and to prepare yourself for the next step. If you are not happy, you will be even more motivated to make those changes. Look for a class that you can take to gain additional skills or to prepare you to move up to a higher position in your company. A long-term financial plan will address all aspects of your finances. This plan should outline a timetable of when you will purchase a house, when you will retire and any career changes you plan to make. It should also include an investing strategy and a plan to build wealth. This plan will help you make financial decisions over the next few years, and can be one of the most beneficial things you do. A financial plan can be more effective than just setting random financial goals without looking at the bigger picture. This is a goal you can work on once you have your budget planned out, or that you can begin working on now. You may want to choose one category each month through the year to look for ways to save money. You may find that you need to keep working on the same category, so that you can continue to find ways to save money each month. If you can slash your spending a bit more each month, you will have more money to put towards your other financial and savings goals.